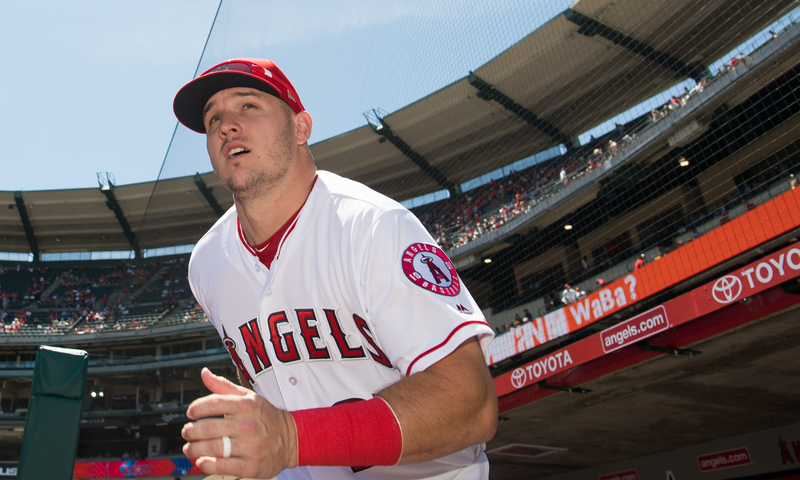 MIKE TROUT hit his 39th home run of the season in the Angels’ 8-5 win over the Oakland A’s Friday night (Angels photo). It doesn’t exactly rank up there with the “Miracle on Ice” of the U.S. Olympic ice hockey team winning the 1980 Olympic gold medal, but it’s giving fans of the Los Angeles Angels an unexpected reason to cheer. After Friday’s 8-5 win over the Oakland A’s in Anaheim, the Halos are 79-81, having posted four straight wins. If the Halos can beat the Athletics on Friday and Saturday, they’ll finish at .500 and avoid a third straight losing season. After rolling up an 8-0 edge – thanks to home runs by Mike Trout (his 39th and the season) and Taylor Ward’s second consecutive dinger, the Angels hung on to post the win, surviving a five-run eighth-inning Oakland rally. Shohei Ohtani was also hot with three hits, two RBIs and a stolen base. Trout’s blast came on the same night the team named him the Angel MVP for 2018. Jaime Barria pitched 4.2 no-hit innings for the home team. He struck out four but walked six. The win went to Taylor Cole (4-2). On Saturday, the Halos will send Tyler Skaggs (8-9) to the mound in hopes of extending the streak to five in a row.